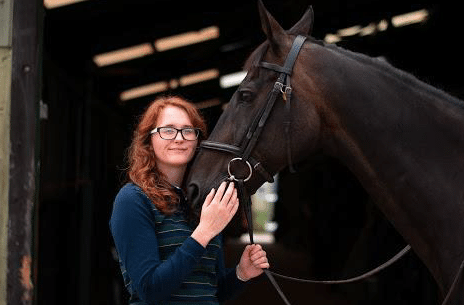 I was recently approached by fellow blogger and ex racehorse owner Chloe from A Balancing Act blog. Like me, she decided the perfect time to get her first horse was while studying her degree. So I was delighted when she asked to share a bit of her story with you and her experience owning an older horse. Me: 22 year old architecture student, currently completing my placement year between my degree and masters. Attempting to balance having a horse, a full time job and studying. Kitski: 16.1hh 20 (almost 21) year old ex race thoroughbred. Kitski had a long, successful racing career between 2003 and 2009. He then went on to be trained by Tanya Bridgeman, and in turn train his owner, Adrian. Kitski moved in with me on full loan in October 2017, and we’ve since made the move from Lincoln to Milton Keynes. We do a little bit of everything at a low level – we’ve been out to a few dressage competitions, zoomed around some show jumping courses and had a go at cross country! One of our favourite things to do though is to hack, and we’re very lucky to be right next to Salcey Forest. We’re not a fan of slow, walking hacks – while we try to vary what we do, we tend to have quite speedy hacks, with lots of interval training. Kitski is an angel in traffic and rarely spooks. He doesn’t buck, rear or bolt, but he will tell me when something is making him unhappy! His favourite trick is to refuse to move in the direction I want, instead choosing to stand, spin and stomp… until he magically resolves his issue and continues on as normal! 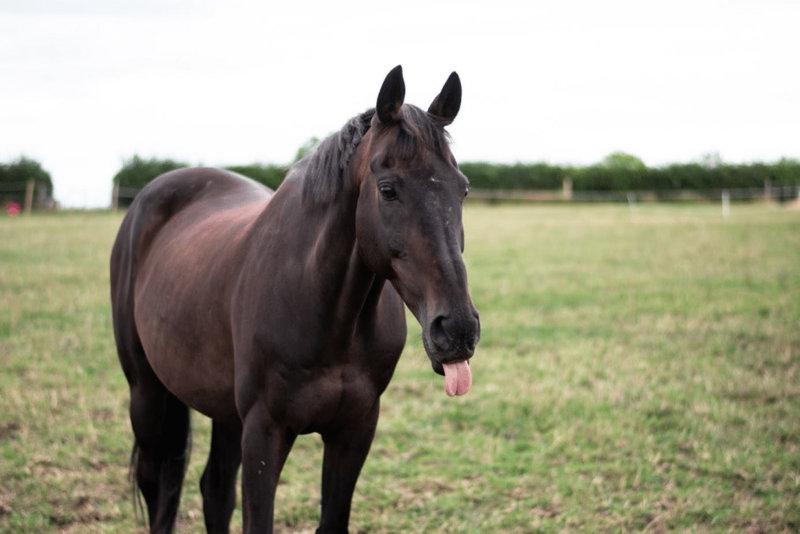 One of the most important things I have found when looking after an older horse is feed. Now, you think feeding an old thoroughbred has to be complicated and expensive, but it doesn’t! Kitski’s main feed consists of Spillers conditioning fibre, which is one of my favourite feeds I have used. This is what he was eating when he came to me and I haven’t felt any need to change it. This uses fibre, protein and oil to provide coat condition and muscle tone – very important in an TB. To support this, he’s also fed Spillers Layoff cubes, which is low energy (to avoid fizzing him up) but provides vitamins, like vitamins C and E.
As we’ve got to know each other more, and as the grass condition has changed throughout seasons and yards, I’ve experimented with slightly changing his feeds. He still has a feed morning and evening, but I have tried adding micronized linseed (to support his weight and condition) and more recently build and glow. The most important thing for him is to have enough forage, mostly through a lot of turnout on good grass. He was weighed in May at 516kg and more recently in January at 513kg – keeping a consistent weight throughout the year. This is definitely something I would recommend, as the weigh tapes I have tried have always shown around 50kg underweight, which was an unnecessary worry. Often local feed shops will have seasonal weigh bridges, as does Spillers. Kitski’s exercise comes in two forms – exercise I make him do, and exercise he gives himself with regular bouts of pony zoomies around his field. He is the perfect gentleman on the ground at all times, but has a little bit of a reputation for taking off on release to his field. Sometimes, he tries to take me with him when the headcollar is still attached, but a treat to distract him usually works! Our general exercise routine over winter is 3 sessions in the school after work. I usually do one of each of the following: lunge, school and polework. We’re fortunate to have a school with lights, but we only jump at the weekend as it’s still too dark after work (bring on summer!). Weekends mostly consist of hacking, but I do try to jump every week or two, because I know Kitski loves it. We only jump to around 80cm because of Kitski’s age and me being a slight wimp! Our hacking and schooling tend to be quite intensive, so Kitski is mostly clipped, with a half face and his legs left on. This means he goes out in quite warm, snuggly rugs. He beats the thoroughbred myths again though, in that he’s actually generally a really warm horse, so I try to not wrap him up too much. He’s perfect for the recent cold mornings when my hands feel like they’re going to freeze off, as he makes an ideal hand warmer! Follow more of their story on Instagram. Lovely to hear Chloe and Kitski’s story and find out about another ex racehorse’s life now! Really interesting read!